Stride Rite Shoes Add A Perfect & Safe Finishing Touch to Kid’s Halloween Costumes! Halloween is almost here! I’m super excited for my girls to get all dressed up and do some trick-or-treating. Pinky has two costumes this year since we’re doing so many events and she couldn’t decide so she has a Pirate costume and a Cinderella costume. This Halloween Stride Rite has the perfect themed shoes around some of the hottest costumes like Spider-Man, Captain America, Star Wars, Disney Princess and Minnie Mouse, and with a breadth of brands including Stride Rite, Sperry Top-Sider, Keds, Saucony and Jessica Simpson, Stride Rite has the shoe to complement any costume. 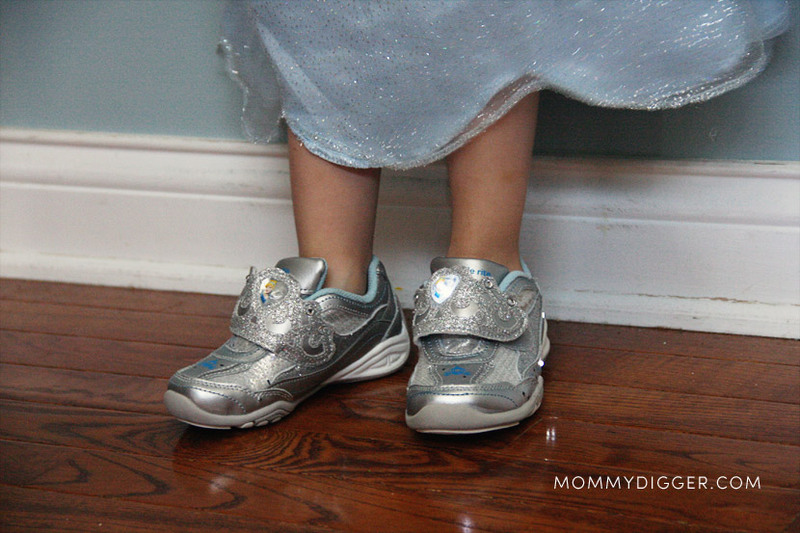 Stride Rite has the perfect shoes for my little princess, Disney Wish Lights Cinderella! I love Stride Rite shoes because they are not only cute but they also give my little girls feet the support they need and are super comfortable. Her new Stride Rite Disney Wish Lights shoes add the perfect touch to her Cinderella costume and even more importantly they offer the perfect foot support and comfort for all that trick-or-treating well be doing. Another great bonus is they will help her stay safe because with every step she takes they light up. The lights are pretty darn bright so it will help cars and bikes see her in the dark. I make every effort to stay safe Halloween night and do everything from inspecting her candy, going with her to each doorstep and ensuring that she can easily be seen as we walk. Her whole costume even lights up and blinks so they’ll be NO missing her walking from house to house. Here is a short video I took of her walking in her shoes, you can tell how bright they are! Of course, Pinky just loves the design, the light up effects, and that they have her favorite Disney Princess on them, Cinderella. BUY IT: If your looking for the perfect shoes for your child’s Halloween costume that also offer added safety visit Stride Rite and check out all the Halloween Stride Rite Shoes. I didn’t even know Stride Rite had these kind of shoes. How cute are these cinderella shoes. I love the brand Stride Rite they have great quality shoes at affordable prices. Nice review, Thanks. How adorable! I love her costume and the shoes just set it over the top, they are perfect and it’s great that they light up for extra safety!